Removal ProcedureRelieve the fuel system pressure. Refer toFuel Pressure Relief.Remove the fuel pipe shield. 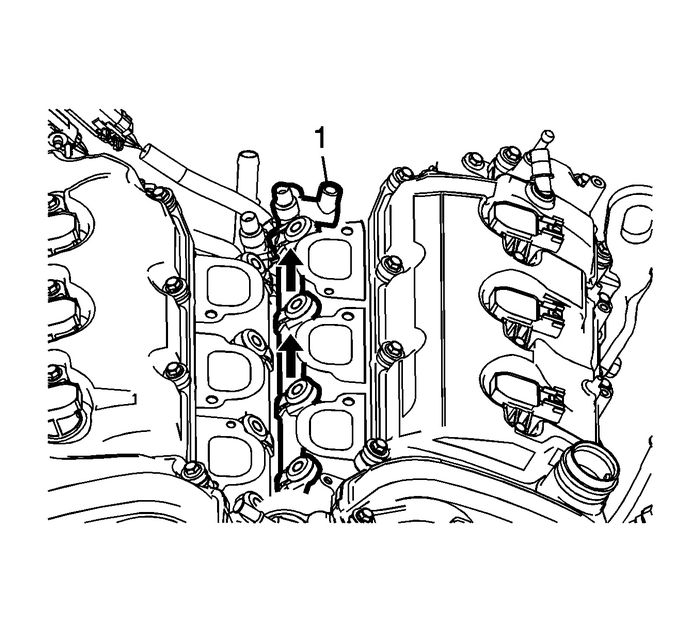 Refer toFuel Pipe Shield Replacement.Remove the intake manifold. Refer toIntake Manifold Replacement.Remove the fuel feed intermediate pipe. Refer toFuel Feed Intermediate Pipe Replacement.Remove the foam insulator from the fuel rails. Cut the plastic tie strap-(1).Disconnect the fuel pressure sensor electrical connector-(2).Remove the fuel pressure sensor-(3). Remove the bank 2 fuel rail fasteners-(1). Remove the bank 1 fuel rail fasteners-(1)-for clearance purposes. 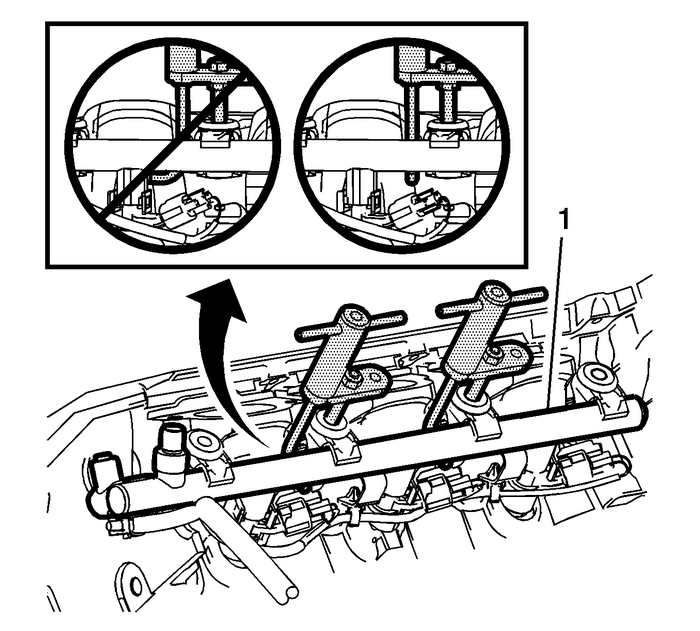 Using the EN-49248–4 hook, raise the fuel rail-(1)-as an assembly.Once the fuel rail is free, remove the EN-49248 special tool. 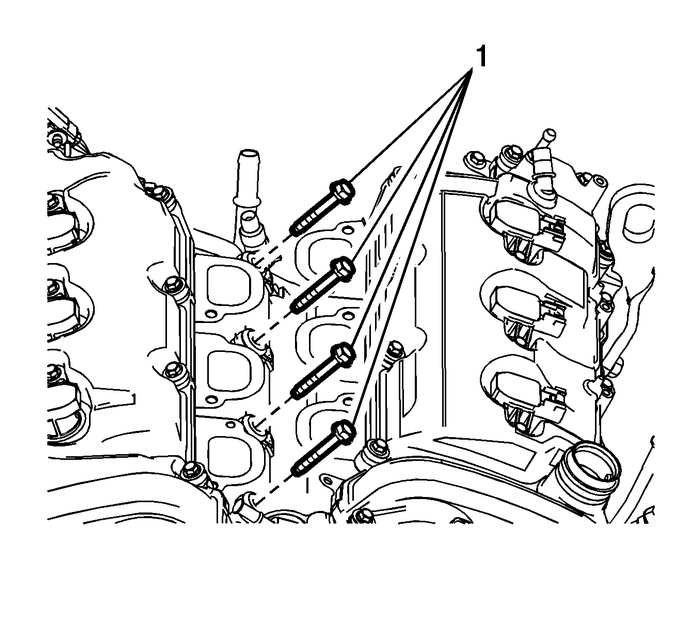 Slide the fuel rail-(1)-toward the front of the engine approximately 1-inch (25.4-mm),in order to clear the center injector bore. 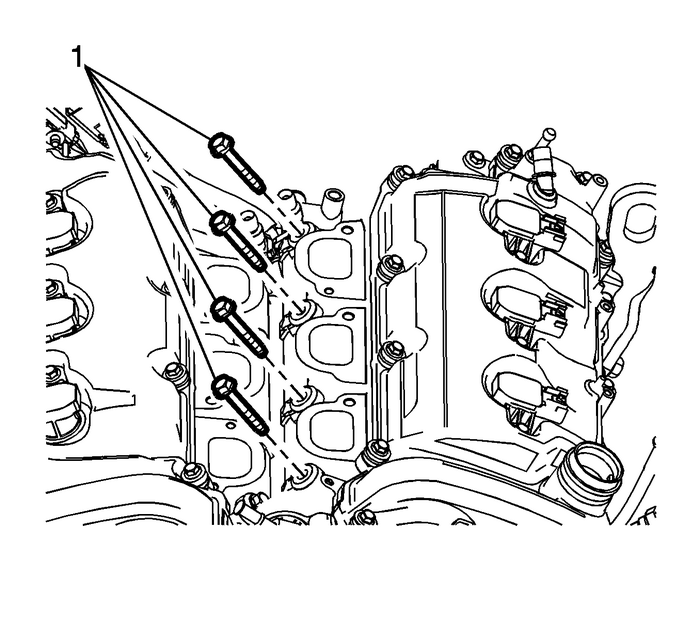 Slide the fuel rail-(1)-toward the rear of the engine approximately 1-inch (25.4-mm),in order to align the center injector bore. 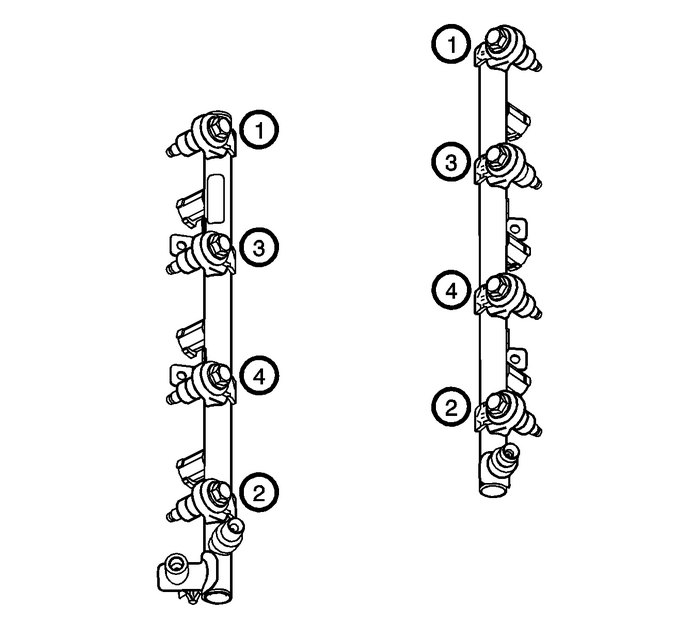 Hand tighten the two outer fuel rail fasteners to seat the injectors.Start and hand tighten the remaining fuel rail fasteners.Tighten the fuel rail fasteners in the sequence shown above to 25-Y (18-lb-ft). 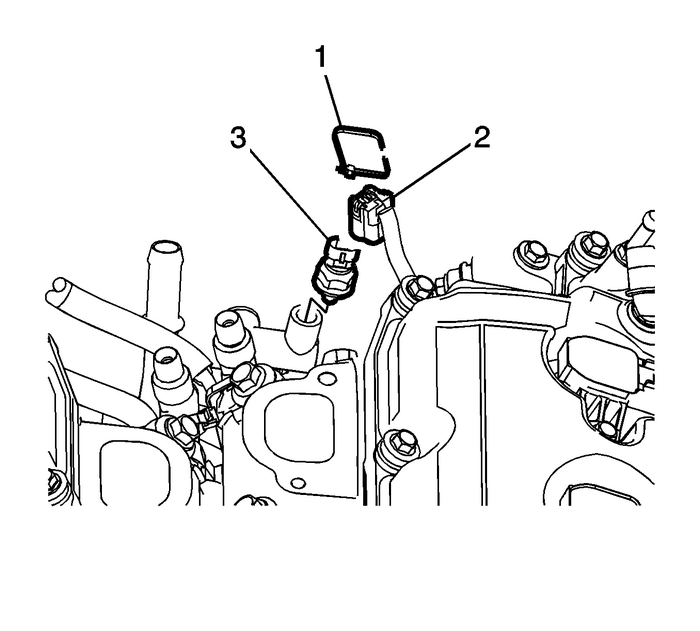 Tighten the fuel pressure sensor-(3)-to 33-Y (25-lb-ft).Connect the fuel pressure sensor electrical connector-(2)-and secure it with a newplastic zip tie.Install the fuel feed intermediate pipe. Refer toFuel Feed Intermediate Pipe Replacement.Inspect for fuel leaks using the following procedure:Turn ON the ignition, with the engine OFF for 2-seconds.Turn OFF the ignition, for 10-seconds.Turn ON the ignition, with the engine OFF.Inspect for fuel leaks.Install the foam insulator to the fuel rails.Install the intake manifold. Refer toIntake Manifold Replacement.Install the fuel pipe shield. Refer toFuel Pipe Shield Replacement.Install the low side fuel pressure service port cap.Install the fuel tank cap.